In R, it is fairly straightforward to perform power analysis for comparing means. For example, we can use the pwr package in R for our calculation as shown below. We first specify the two means, the mean for Group 1 (diet A) and the mean for Group 2 (diet B). Since what really matters is the difference, instead of means for each group, we can enter a mean of zero for Group 1 and 10 for the mean of Group 2, so that the difference in means will be 10. Next, we need to specify the pooled standard deviation, which is the square root of the average of the two standard deviations. In this case, it is sqrt((15^2 + 17^2)/2) = 16.03. The default significance level (alpha level) is .05. For this example we will set the power to be at .8. As we have discussed before, what really matters in the calculation of power or sample size is the difference of the means over the pooled standard deviation. 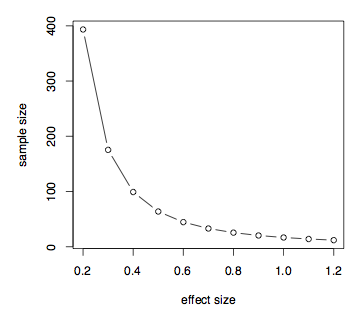 This is a measure of effect size. 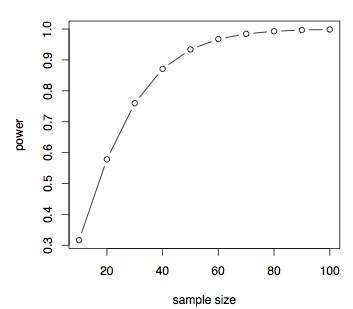 Let’s now look at how the effect size affects the sample size assuming a given sample power. We can simply assume the difference in means and set the standard deviation to be 1 and create a table with effect size, d, varying from .2 to 1.2. We can also easily display this information in a plot.